A council labelled the worst-run in the country and facing "severe financial challenges" lent a law firm nearly £1m, it has emerged. 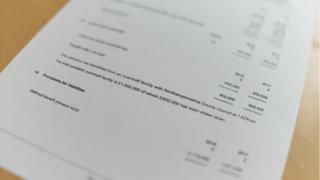 Northamptonshire County Council was twice forced to stop all non-essential spending in 2018. But the BBC has learned the council continues to offer a £1m overdraft facility to a company called LGSS Law. The credit was offered to "ensure the emerging company avoided any cash flow difficulty", the council said. LGSS Law - which is owned by Cambridgeshire County Council, Northamptonshire County Council and Central Bedfordshire Council - was founded in 2015 with the aim of providing a "new model" for public sector legal services. It now has more than 100 public sector and not-for-profit clients, including Ipswich Borough Council and Corby Borough Council, and employs more than 150 people. Filings with Companies House reveal LGSS Law, which had an £8.7m turnover in 2018, drew down £950,000 of the Conservative-led council's £1m overdraft in 2017-18. Labour councillor Mick Scrimshaw, who is also the county council's overview and scrutiny committee chairman, said: "There are definitely questions that need to be asked. "There is no question that the council could do with that money back. It would go some way to dealing with the overspend." September, 2017: The council launches an appeal for fairer funding from central government as a Local Government Association (LGA) peer review group says it is "running out of time"
A council spokesman said the overdraft was provided when the company was established. "This was before the council's recent financial difficulties," he said. "The purpose of the overdraft was to provide a working capital to ensure the emerging company avoided any cash flow difficulty. "This facility is still required by the company at this present time." LGSS Law did not respond to questions about the overdraft from the BBC. The county council - once called "the worst run in the country" by Kettering MP Philip Hollobone - is projected to overspend this financial year.